A controversial Egyptian preacher urges President Morsi to kill “thugs” and “criminals” who are burning the country. A controversial Egyptian preacher and Islamist writer has urged President Mohammed Morsi to kill “thugs” and “criminals” who are burning the country, otherwise people will do it themselves, Al Arabiya reported. “I am saying this publicly and I am inciting the killing of criminals; I say criminals; thugs, thieves, those who are burning the country and those who are killing innocent people,” the preacher, Wagdy Ghoneim, was quoted as having said in a YouTube video. “If the police or the prosecution will not restore justice, we will restore justice...God willing,” he added, according to Al Arabiya. Ghoneim said Morsi should “use his powers” and be tough on “outlaws” that are burning state institutions and inflicting harm upon the people. “Your kindness will not work with these thugs Mr. president,” he said. Ghoneim is reportedly banned from several Western countries, including the United States and the UK, for activities deemed to foment hatred or encourage and support violence. Some of his previously controversial statements include gloating over the Hurricane Sandy disaster in the United States last October, and the death of Coptic Pope Shenouda III. Ghoneim described the hurricane as revenge from Allah for the “Innocence of Muslims” film made that sparked waves of violent protests across the Muslim world in September. "Some people wonder about the hurricane in America and its causes," Ghoneim wrote on Twitter. "In my opinion, this is revenge by the Lord [Allah] for [harming] his beloved Mustafa [another name for the Prophet Muhammad]...," he added, alluding to the film. In March of 2012, reported Al Arabiya, Ghoneim said Egyptians should be happy for the death of Pope Shenouda III, whom he described as anti-Muslim. His latest statements against “thugs” and “criminals” came as thousands of liberal forces have demonstrated across Egypt against Morsi, calling for a new constitution that answers the demands of all Egyptians. At least 50 people have been killed in riots that broke out last week during the two year anniversary of the uprising that toppled President Hosni Mubarak. Many of the casualties were in the city of Suez, where the military was sent to quell the riots. 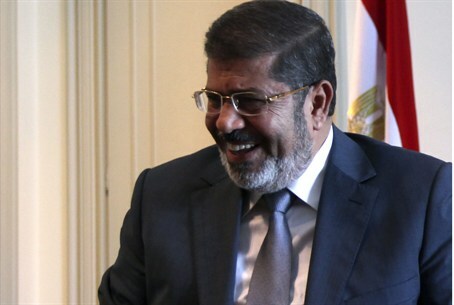 Morsi declared a state of emergency on Sunday and placed three cities under curfew because of rioting – Port Said, Suez and Ismailiya. Egyptian Defense Minister Gen. Abdel Fatah al-Sisi warned on Tuesday that Egypt could be facing collapse because of the riots.